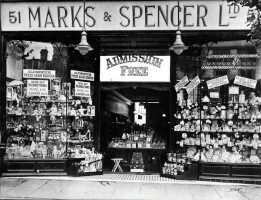 Over the last 3 years our dedicated volunteers and members of the Archive Team have been busy cataloguing M&S UK store photographs. Over 1,600 photographs (and counting!) have now been added to our collection catalogue of stores from Aberdeen to Edmonton. The catalogued photographs have already proved to be popular with researchers in our Reading Room, looking at high street development and the use of visual merchandising in window displays. 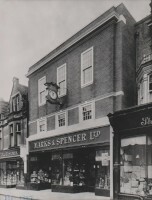 The photographs range from early pictures of Penny Bazaar stalls and store frontages to more recent store openings and refurbishments. Browse our store photos by searching reference p1/1 in our online catalogue.